Once, eight long years ago, there existed a time of peace and prosperity in Middle Earth. The free teams of major league baseball—be they Sox of Red or White, Cubs, or Blue Jays—competed amongst one another in harmony, without one team ever gaining too much power. 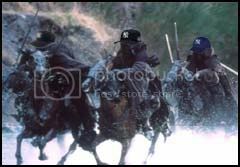 The Yankees, the most storied franchise in Middle Earth during the First and Second Ages of Baseball (winning 22 championships), lay dormant. Eighteen years had passed since New York had last claimed baseball’s most covet prize: the World Series Ring. The free peoples of the National and American Leagues believed they had nothing to fear from The Mount That Ruth Built, which lay deep in the heart of the Bronx. But they were all of them deceived. The Dark Lord Steinbrenner had lulled the free peoples of Middle Earth to sleep with feigned bouts of incompetence during the 1980s, all the while constructing a grand dynasty in secret. He finally unleashed his evil hordes in 1996, to the ruin of all. Braves (twice), Padres, Mets—all tried to challenge the Dark Lord, yet none were any match for his immense power and bottomless wallet. The baseball world plunged into a time of seemingly-endless darkness. One by one, the free teams of Middle Earth fell to the power of the Ring, but there were some who resisted. The Arizona Diamondbacks, a motley collection of aging ballplayers from the desert, were stout of heart (and strong in pitching) and pushed the Dark Lord’s minions to the brink of elimination in 2001. Yet in Game 7, the battle seemed almost over: the Yankees held a one-run lead with their most terrible servant (Mariano Rivera) on the mound. It was in that moment, when all hope had faded, that Luis Gonzalez, star of the Diamondbacks, took up his sword and struck a mighty blow against evil. His Series-winning single cut the Ring from the hand of the Dark Lord. 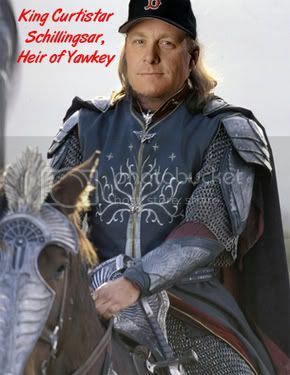 Steinbrenner, enemy of the free peoples of Middle Earth, was defeated. History became legend, and legend became myth. And for three long years, the Ring remained safely beyond the evil clutches of Steinbrenner. Following the in the Diamondbacks' stead, the Angels of Anaheim vanquished the Yankees once again in 2002. It was a strong-armed flamethrower from the southern reaches of Florida (Josh Beckett) that prevented a Yankee triumph in 2003. Meanwhile, the Dark Lord’s lust for his precious Ring grew insatiable. He vowed to spare neither expense nor revenue: the Ring would be his. In 2004, rumor grew of a shadow in the AL East; whispers of a nameless fear encircled the baseball world. The Dark Lord Steinbrenner called together his most wicked minions, the terrible Ringwraiths, a collection of nine once noble All-Stars corrupted by greed and hatred. When the Dark Lord succeeded in twisting the fearsome Witch King of A-Rod to serve his malicious purposes, the free peoples of Major League Baseball were plunged into despair. The Nine have terrorized the American League for the past six months, bludgeoning their payroll-poor opponents to death with a powerful offense and strong bullpen. Even the formidable Twins were no match for Steinbrenner’s minions earlier this postseason. This set the stage for a final showdown between the forces of good and evil. The Red Sox of Boston, last vestiges of a long-suffering race, initially faltered under the heavy offensive onslaught of the Nine. The battle seemed all-but-over; the hordes of the Bronx were already eying their next conquest. The Ring was so close the Dark Lord could feel its presence. Then, the unthinkable occurred. On the very brink of destruction, the Red Sox suddenly halted the march of Steinbrenner’s minions. The tide of battle had been turned. Schilling, who carried upon his broad shoulders the hopes of Middle Earth, valiantly overcame his wounds and struck a critical blow against the Dark Lord. His performance on the very slopes of Mount Ruth allowed the Bostonian army to overcome incredible odds and force a decisive game seven. The unsung Johnny Damon then ensured the Shadow would be kept at bay for another year, completing a most improbable victory. Although they have been defeated, the Dark Lord and his minions will not rest. His Eye is ever watchful, constantly searching for more free agents to seduce. Yet for now, the free peoples of Middle Earth can sleep well, for certain doom has indeed been averted. The battle for the pennant is over. The battle for Middle Earth, however, has just begun. Note to readers: Since I wrote this a few days ago (back when I thought the Yankees were a cinch to win the pennant) I also have a version with an alternate ending. You can read it here. I actually think it's better in some ways (except for accuracy, of course). Well folks, it's been pretty tough to concentrate on anything Twins-related these past few days. We're in the midst of history: before tonight's 4-2 Boston win in Game 6 of the ALCS, no team in the history of baseball had ever forced a Game 7 after falling behind three games to none in a series. I repeat: this has never happened before! To put this into perspective, consider this: since postseason play began back in 1903, there have been a total of 127 seven-game postseason series played (93 World Series and 34 seven-game LCS). This also takes into account that baseball had a 9-game World Series in 1903, 1905, 1919, 1920, and 1921. It also accounts for the lack of a postseason in 1904 and 1994, as well as the five-game ALCS and NLCS played from 1981-1984. I don't know what's more amazing, the fact that the Red Sox were able to accomplish this feat or the fact that it had never happened before in 127 chances! However, they haven't won anything yet. This could easily be all for naught if Derek Lowe can't keep the Yankees at least somewhat in check tonight. I don't know about you, but I'm going to be glued to my TV tonight! Another reason today's abbreviated post is entitled "Prelude" has to do with what's on tap for tomorrow. I have a very entertaining post all written out for tomorrow night that I hope many people will enjoy. It isn't technically Twins-related, but rather the next best thing: Yankee-bashing. If that topic's not a winner, I don't know what is! Be sure and check out Twins Chatter tomorrow (or sometime after tonight's game). I don't think you'll be disappointed.